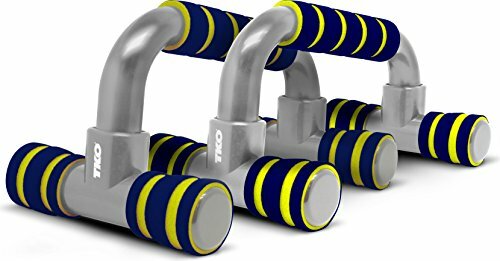 The TKO angled Push-Up bar is made with of a heavy-duty plastic construction to withstand even the toughest of workouts. Secure and comfortable padded grips reduces the stress on wrist and forearms; unlike traditional push-ups which might hyperextend your wrists or cause pain due to the angle. By using the TKO angled Push-Up bar your range of motion is increased which allows for a better upper body workout. Not only are you improving your Pushup form and positioning, but you are targeting your core muscles. No other exercise, other than weight training, builds and tones your pectorals and triceps more effectively than push-ups. Seamlessly incorporate the TKO angled Push-Up bar into your daily workout routine to develop stronger muscles in your chest, arms and shoulders. Up your fitness PROGRAM and see the difference.